THIS IS A STORY THAT BEGAN SO LONG AGO THAT ONLY THE STARS WERE PRESENT AT THE BEGINNING AND THE END. 1,000,000 years ago a giant tortoise lived in South America. Giantess George ate prickly things like cactus and ground-growing greens that grew in her ancient desert. But Giantess George's earth was a very restless planet. Earthquakes and tectonic forces were reshaping the land, and giant storms roiled the oceans, and in one such storm she was swept into the sea where she stayed afloat until she came upon a island of debris to crawl upon and drifted until she came to a small island that came to be one of the Galapagos Islands many millennia later. Giantess George found ground vegetation there and thrived, laid her eggs, and populated the island. But a small island is dependent upon ocean air masses for its rain, and one year the rains didn't come and the grasses didn't grow. Luckily, Giantess George had a rather long neck for her kind and she managed to live by reaching up for leaves from the lower branches of small trees. Since only the longer-necked tortoises were able to survive the frequent droughts on her island, Giantess George's descendants passed on their longer necks and her kind adapted well to life in her new habitat. Fast forward hundreds of thousands of years on San Cristobal Island. Darwin visits and remarks on the long-necked giant tortoises he sees and many seaman stop by and leave behind some of the animals that sailed with them. Hungry for meat, they took the tortoises onto their vessels as a living shipboard larder when they needed it. Gradually the plentiful tortoises became scarce and then rare. And then in the twentieth century, scientists realized that there was only one giant saddle-backed Galapagos tortoise to be found. They named him George, moved him to their research station on Pinta Island, and a serious search began for a companion for him, a mate who would help perpetuate the species. But no mate was ever found anywhere in the Galapagos, and George became the famous Lonesome George, living out his days alone until his species died out with his death at four o'clock on June 23, 2012. 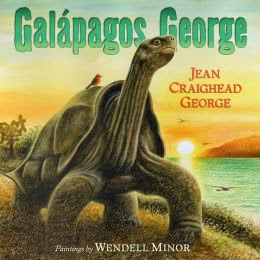 Famed Newbery-winning author (for Julie of the Wolves and My Side of the Mountain) Jean Craighead George's last book, Galapagos George (Harper, 2014), tells this true tale of how habitat change can bring down even such a mighty species as the giant tortoise. A fascinating account of species adaptation and decline, George's book is full of portent for us, the only species on earth who can actually affect the forces that shape our planet's life. Ironically, author George and Lonesome George died within weeks of each other in 2012. Artist Wendell Minor's powerful, almost monumental, watercolor illustrations tell her final story well, and despite its sadly inevitable ending for its subject, Minor ends with a tribute to the author with whom he had worked on many books with her own hopeful words. "As long as there is life, there will always be new and unimaginable things that can happen. And they do, all the time." Appended for nature science students are a glossary, a timeline of the giant tortoise, and a bibliography of resources which includes books and websites for further investigation. Publishers Weekly awarded George's last book a starred review, saying "Skillfully capturing the concept of adaptation in natural selection, this succinct story continues its creators’ tradition of inspiring awe and appreciation for the natural world." Hail and farewell, Jean Craighead George.